Richard Deacon’s mother was a doctor and his father was a pilot, and he has described his own vocation as a sculptor as a confluence of the two. On the one hand, his large-scale abstract sculptures are explorations of organic form. There are suggestions of ears, mouths, internal organs. On the other, they are feats of engineering; many are built with a surrounding “skin” like an aeroplane. This survey of his work so far is impressive: sensual, technical, and sorrowful at times. Deacon, 64, came to prominence with the New British Sculpture of the early 80s. He often uses natural materials – wood, metal – but they are steamed, twisted, processed. There is much dynamism in these works, but they are not aggressive. Rather than monolithic sculptures seeking to dominate, they are meditations on a life lived. They have a pulse. The early work is poignant. I love the series of drawings that Deacon made in the late 70s after reading Rainer Maria Rilke. “It’s Orpheus When They’re Singing #8” (1979) is a large drawing in oil pastel, crayon, and graphite on paper. The black lines are certain and swooping, creating space within their irregular circles, creating more space around the circles. Deacon is a philosophical artist and the drawing is elusive; I found myself returning to look at it again and again. If you stand at a certain point in the gallery, the drawing is aligned with a sculpture, “Untitled” (1980). They resonate with one another. The idea of resonance is key to Deacon’s work, as the title of the drawing suggests. The sculpture is a large husk, like a cross between a conch and a military aircraft part, exploded out of the sky. It seems designed for listening, a receptacle, with an opening at each end. Made out of galvanised steel and concrete, the surface is scuffed and marked with numbers. There is the sense of time, passed. Indeed, there is something tragic about the way the sculpture is laid on its side, as though discarded. And yet the dark space inside seems more like a refuge than a void. Deacon was particularly inspired by Rilke’s image of Orpheus’ head, cut off from his body but – miraculously – still singing. Many of these works mimic the shape of that head in subtle ways: they are vessels, apertures, cavities, holes. Rather than emptiness, they point to a kind of grand turning inside out. The hidden interior is made visible: this is Deacon’s skill as an artist. 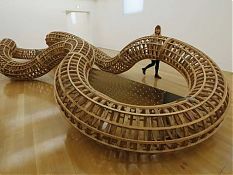 It is evidenced in “After 1998”, often cited as his seminal work, a large serpentine structure that writhes over the gallery floor, as though in death throes. The inside is hollow and the surface is comprised of wooden parts joined together like a skeleton. The skeleton is the “skin.” The surface is the “bones.” If After resembles a snake, it is a headless one, and therefore monstrous. However, the overall tenor of this exhibition is light, and most striking is Deacon’s joy in the materials themselves.